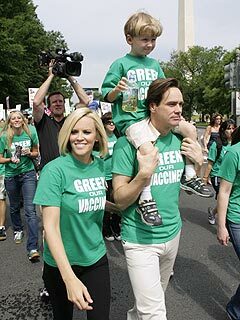 Jim Carrey and Jenny McCarthy joined the 'Green Our Vaccines' march with thousands more yesterday in Washington D.C. to raise awareness about autism. They, along with national autism advocacy groups, took the task to raise awareness about toxins in vaccines and to change children�s vaccination schedules. They are basically focussed towards removing the toxins in the vaccines given to children which could be the reason for developing symptoms of autism in small children. Jenny's son Evan is diagnosed with autism which encouraged Jenny to find more about this problem and also inspired her to write the book "Louder than Words" where she laid down her experiences which she had gone through while struggling for her son's treatment. Jim Carrey supported her throughout and played an important role in making Evan overcome his problem and act like a "normal" child. So, Jenny mentioned Jim as "Autism Whisperer" and is thankful to him for all his love and support. Jim also mentioned that Evan taught him to love. -- Source: CNN. Click to comment this article.